Recently I found myself at a bit of a crossroads. Horologically I mean, as I was having trouble with a new discovery I had made. You see, I had just been slapped across the face by something entirely unexpected. Unexpected by me at least and I needed to come to terms with the fact that I may have been wrong if this new development was to be accepted as reality. For years I have fawned and drooled over all sorts or horology, with a great many brands capturing my attention and securing my lust. In the past I could name at least 50 brands and a couple of hundred different watches that I desired at any one moment or another. These days there is no way I could possibly remember all the pieces that I want; there are simply too many. Having such wide tastes and enjoying so many different things about different brands and their watches, a few – over time – have managed to sneak through and become almost permanent residents of my “Couldn’t Care Less” list (CCL). In some cases, I didn’t care for the design, in others I didn’t see the appeal of the brand, and with others still I could never place my finger on why they just rubbed me the wrong way. Some of these brands have moved off the list as I learned more, but others sit there still, waiting for a change of heart but with little hope of them inciting any real passion in me. So imagine my surprise when SIHH 2014 rolls around and one of the longer running members of my CCL list debuts a new model that not only blows my socks off design-wise, but features an outstanding movement to appease my inner horology nerd. The brand that I had largely ignored for so long is the wildly popular, yet extremely divisive Officine Panerai. Before any Paneristi threaten to kidnap me, let me tell you why Panerai was on my CCL list. The first reason, and probably the biggest, is that I am just not a fan of cushion-shaped watches. There, I said it. The shape just isn’t something I prefer, and I tend not to be impressed by new models from many brands that go with this case shape. The second, and smaller reason, is that Panerai stays very true to its roots (a good thing, mind you) and doesn’t necessarily evolve in terms of designs very much, meaning a relatively consistent flavor that can’t grow on you because it always stays the same. Now you can see that my reasons are ENTIRELY subjective and of personal preference, and doesn’t really reflect on the brand or the quality of the timepieces. I just never thought that Panerai could produce something that would make me extremely enthusiastic. Finally I had a reason to be as passionate about this brand as its devoted followers are. I never really spoke negatively of Panerai, on the contrary, I have always said that its watches are well-made with a strong design. I just hadn’t caught the bug yet. 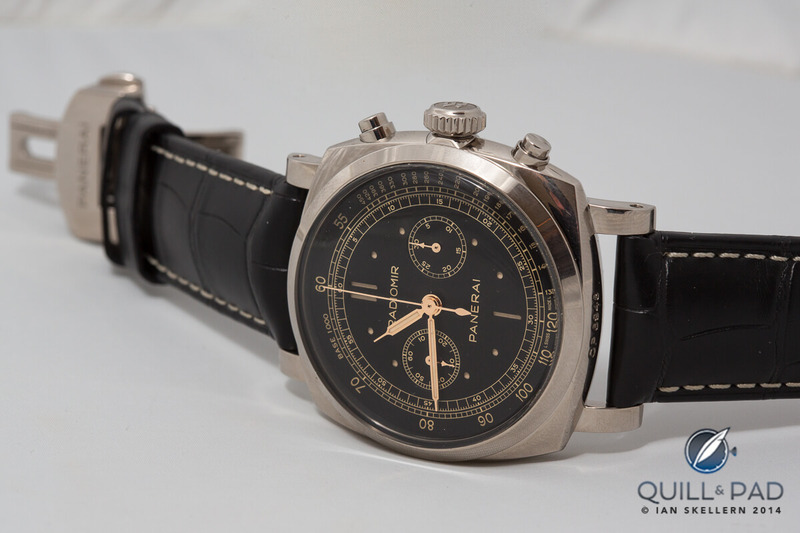 But that changed with the new Radiomir 1940 Chronograph. While I still might pass on their other pieces, this new limited edition takes the brand where I had hoped it might one day tread. And in reality, it’s also where many of the Paneristi might not like it going. Panerai, as I mentioned before, stays very true to its roots and doesn’t play around with fads or trends, opting to remain on a resolute path of assured success. This is why it is so popular and at the same time so divisive, because those that love these watches love everything about them, and those that haven’t caught the bug won’t ever find something to enjoy when nothing dramatically different happens. It’s a tricky niche to be in, but one that is working out very well for Panerai. With the release of the Radiomir 1940 Chrono, the brand departs a fair amount from its tradition to create a vintage-inspired piece that makes the best attempt yet to break the mold and try something different. The L.E. Radiomir 1940 Chronograph has a set of dials, as each of the three models tries something a little different. All the dials feel a lot more vintage than anything to date. My favorite dial comes from the white gold version, the PAM 520, where the traditional slots are reduced to a minimum and crisp little holes offer themselves as what could be a new standard for sandwich dials. Also, the large cutout numerals are gone, replaced by a double chapter ring on the exterior, one of them for the minutes with the other becoming the tachymeter scale. This is the first time this style of dial ornamentation has been used for Panerai (if I understand it properly), and for me it goes so much further in creating visual interest. While I subjectively dislike style solutions such as the cushion-shaped case or, in terms of other brands, two-tone cases and bracelets (gold and silver just don’t mate well in that respect for me), I have always held a soft spot for pre-1960s chronographs with scales and chapter rings. Something about them screams functionality and precision, which in many cases could save your life. My favorite, to this day, are the old spiraling telemeter scales used by soldiers and weather forecasters to judge distance simply using sound and elapsed time. For that reason this design spoke so strongly to me, it actually reminds me of a vintage piece that I would lust after. It is basically what Panerai would have done if it had followed its contemporaries’ style in the 1940s. The Paneristi are glad, I’m sure, that it didn’t follow the herd, but I see it as a missed opportunity to have had this watch for more than seventy years. It must be taken into consideration, however, that Panerai didn’t build watches for the public; instead it only produced tool watches for the Italian Navy, which means that Panerai watches were always, first and foremost, tools to be used. I can appreciate this as a fellow tool nerd. The design of the new L.E. Radiomir 1940 Chrono is amazing, but what actually sealed the deal for me was what was inside. 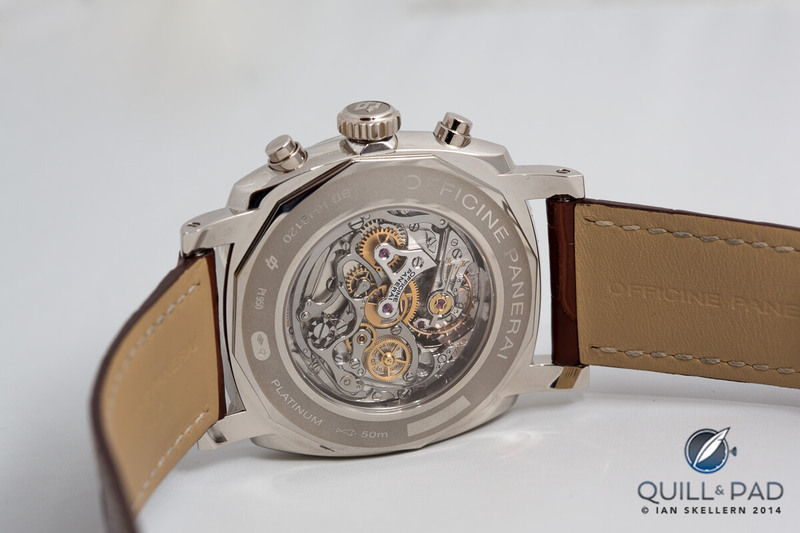 It is nothing other than a legendary Minerva-based column-wheel chronograph movement finished to very nice standards. To be frank, I flipping love column-wheel chronograph movements. The cam and lever or coulisse chronograph movements are very good, but they just don’t offer the same satisfaction as a finely adjusted column wheel. And this movement and its construction are among the best in the industry. It’s only a few steps and processes away from being able to compete with the king of beautiful chronograph movements: the A. Lange und Söhne Datograph. Originally modified and adjusted by Panerai into its own OP XXV caliber, the movement has a depth and complexity that I love staring at, and if it weren’t for a dial that is as stimulating as this one, I would probably wear the watch backward every day of the week. It would be case back Thursday every day for me. So with the addition of this incredible movement, the subdued and very classic styling of the case and dial without Panerai’s standard “toolish” details, this watch shocked me, and by the response it got, many other enthusiasts as well. I think Panerai is on the right track with this piece, though I doubt it will create a major change for the brand, which has such an incredibly devoted fan base. If anything, it allows the non-Paneristi to understand the passion, at least for a little while. Here I sit proclaiming my lust for Panerai, something I never thought I would do. But things can always change for the better, and this is definitely a good sign to me! • Wowza Factor * 7.99 That’s a full 6.4 higher than anything I would have guessed a Panerai could do to me…consider me humbled! • Late Night Lust Appeal * 29.234 gn » 286.688m/s2 Almost six times the g-load for a Formula 1 car, the Radiomir 1940 Chronograph surprisingly had me lusting well into the wee-hours of the morning. • M.G.R. * 53.95 Beautiful Minerva based column-wheel chronograph movement, always going to be relatively geeky! • Added-Functionitis * Cause For Concern Having a chronograph is an extremely useful added function, so I would have to advise the extra-strength tube of Gotta-HAVE-That cream for its inspiring swelling. • Ouch Outline * 9.25 – Accidentally being exposed to large caliber gunfire without hearing protection Some people don’t realize how loud, and damaging, the miniature explosion from a firearm is. It’s something exploding…and then breaking the sound barrier right next to your face. It hurts, and yet….? Totally worth it to strap this to my wrist. • Mermaid Moment * Realizing They Proved You Wrong When you get proven wrong in such an enjoyable way (you know, by loving the thing that makes you incorrect) then you fall under its spell pretty quickly. • Awesome Total * 828 Multiply the size of the case by the fifty-five hour power reserve, then divide by the number of models. And then add the number of models for good measure.